Omega Juicers is a well-known brand for commercial-grade juicers in the market. For the past 30 years, they have provided consumers with reliable and efficient vertical juicers that can extract up to 30% more juice than other brands’ products. Health-conscious people who are looking for effective juicers that can maintain the healthy enzymes of fruits and vegetables will find that this company provides solutions to their juicing concerns. 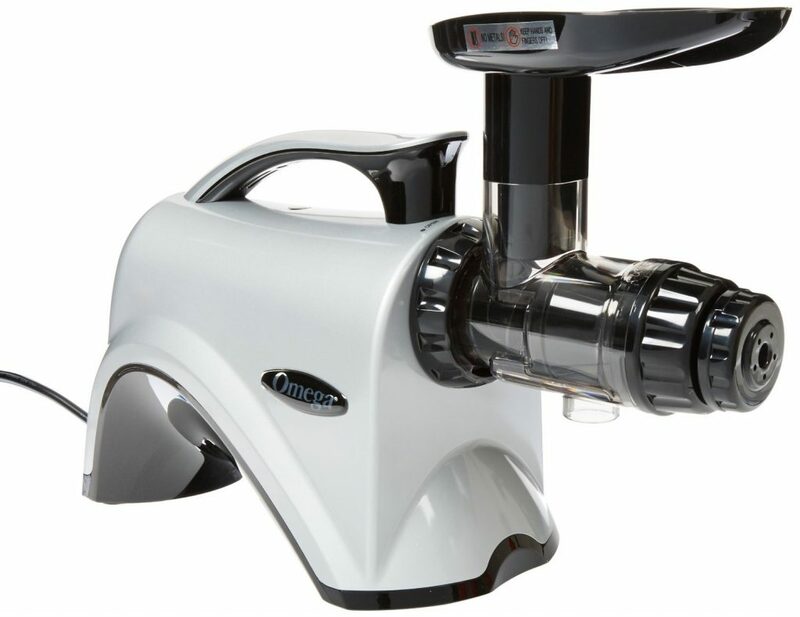 They are currently the only company that offers centrifuge, masticating, and pulp ejection style juicers, so customers are sure to score something that will suit their needs and preferences among Omega Juicers’ offerings. This model is one of the brand’s masticating juicers that come with a powerful motor for high juice yield. It has a low speed of 80 RPM to avoid clogging and heat buildup, and employs a dual-stage juicing system to make sure you get the most out of your ingredients. Continuous juicing is made possible because of its auto pulp ejection function. It also has a juicing screen installed in the machine. The Omega J8006 Nutrition Center is also a versatile machine. Not only can it be used for juicing, you can also make desserts and even use it as a food processor and grinder. It has homogenizer and food processor attachments for when you want to use it for food preparation. 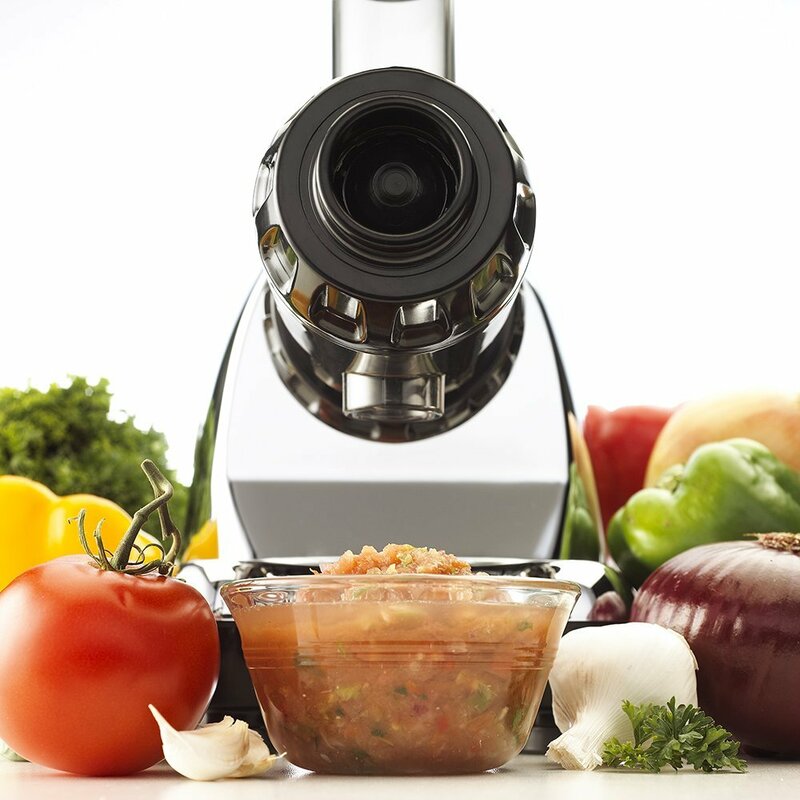 You can chop and mince your ingredients and still keep its nutrients. You can also make nut butters and baby food, among others. What’s even more amazing is that you can grind coffee beans and make natural flour using this juicer. This high-quality machine has also earned five-star reviews on websites like Amazon, where users claim that it is the best value juicer in the market today. Some comment that this masticating juicer is best for juicing leafy greens and most other vegetables as well as wheatgrass and apples. In addition, they appreciate its quick cleanup time, which supposedly takes less than three minutes because of the juicer’s small screen and few parts. It also has an outstanding warranty period of 15 years, much longer than what most juicers on the market offer today. Another masticating juicer, the Omega NC800 HDS 5th Generation Nutrition Center Juicer has a similar low speed and dual stage juicing system as the Omega J8006 Nutrition Center Juicer. They also share the same dimensions, but the former is heavier by three pounds. This low speed system ensures less foam and froth and also prevents oxidation. Besides the 80 RPM speed, it has five adjustable settings for maximum juice yield, which makes it highly efficient and productive. It also promises continuous juicing with automatic pulp ejection, with pulp so dry you just know you got the most out of your produce in the juice. You can adjust the settings to include pulp in your juice as well. It has six nozzles and two juicing screens for convenient and worry-free juicing. The NC800’s tight juicing chamber presses produce to squeeze maximum juice and keep healthy enzymes locked in, much like the J8006. It works great with leafy vegetables as well as fine produce like wheatgrass, and you can easily throw in fruit without any problem. You can simply put these ingredients in there without having to slice or chop them up as it has a wider feed chute than the J8006. This makes for faster juicing time compared to other models. In addition, it’s very easy to clean. It also doesn’t make as much noise as other juicers. This is great news for those who like to do their juicing early in the morning. 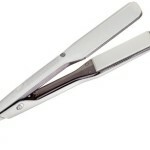 Many users commented that it’s more convenient and is worth the price difference. Because of its larger chute and plunger, juicing becomes more efficient, and buyers loved this about the NC800. It’s also powerful and can be used to make nut butters, baby food, healthy snacks, and milk like the J8006. 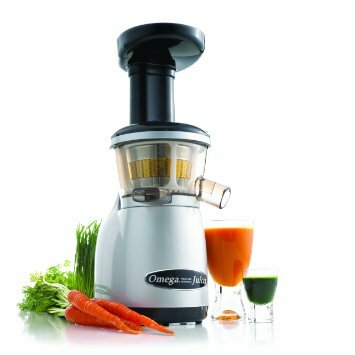 If you are looking for versatility and high performance in your Omega juicer review, this model has everything you look for. On the whole, if you don’t mind spending a bit more money for a more expedient and sturdy device, you may consider levelling up from the J8006 to the NC800. It’s faster and more commanding and it lets you control the way you like your juice to come out. It’s a bit heavier than the J8006 but with the greater capacity of the chute and plunger, it is a reasonable trade-off for greater ease of use and quicker juicing time. 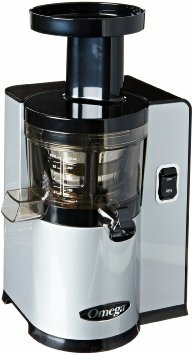 This model is the lowest speed masticating juicer from Omega. At 43 RPM, its speed is almost half of the J8006 and NC800. Combined with its compact design and tighter auger strains, the Omega VSJ843RS enables its gentle squeezing action to get the most juice and nutrients out of your produce. It also breaks down fiber to get smoother and nutrient-rich juice. Like the J8006 and NC800, it also has the capacity to keep healthy enzymes intact, delay the oxidation process, reduce heat buildup, and prolong the shelf life of juices. You will have no problem juicing both hard and leafy vegetables, fruits, and fine produce with this model. The advantage that the Omega VSJ843RS has over the J8006 and NC800 is its auto-cleaning system. While the other two are already relatively easy to clean compared to other juicers in the market, this feature of the VSJ843RS makes it even more painless and convenient to use. It also helps keep the screen clear so you know that you strain the maximum juice from your produce with every use. Because of its vertical design, it has a larger screen surface compared to the J8006 and NC800, which reduces pulp output and makes juicing faster as you don’t have to clear the screen surface as you go. It has an automatic pulp ejection system as well, so continuous juicing will not be a problem. You can easily make different kinds of nut milk. The Omega VSJ843RS is also much more expensive than the J8006 and NC800. With the steep price point, some might understandably be hesitant to purchase this juicer. However, buyers who have made this an investment couldn’t be happier with its features. From the very quiet juicing process to its ease of use and even easier cleanup, online reviews suggest that the VSJ843RS is definitely worth it. All in all, if you don’t mind spending a lot on a powerful and quiet juicer with a slow squeezing process to give you maximum yield and nutrients, the Omega VSJ843RS is a great option. Compared to the J8006 and NC800, it’s more capable and even more compact, so it can fit into any kitchen and give you what you need the way you want it. Much like the VSJ843RS, the Omega VERT Slow Juicer VSJ843QS is another low speed juicer with a new motor that has a 43 RPM juicing system. It has the same tight fit dual-auger that strains more juice and makes for smoother shakes. However, the VERT Slow Juicer VSJ843QS has a square body design, unlike the compact round body of the VSJ843RS. It would fit right into any kitchen just the same. It comes in a silver body that gives it a clean-cut look. Unlike the NC800 which has a large chute and plunger, you have to cut and slice things up before putting them into the VERT Slow Juicer VSJ843QS. This juicer also yields the least pulp and is able to extract maximum juice in the process. However, some online reviewers lamented that the VERT Slow Juicer VSJ843QS is not as versatile as other juicers from Omega. It’s supposedly not able to make nut milks, unlike the J8006 and NC800. But for all your plant-based nutrition needs, this juicer has the answers. Like the VSJ843RS, the VERT Slow Juicer VSJ843QS also has an auto-cleaning system for easy and convenient cleanup. You can also painlessly remove the juicer’s parts to clean the insides yourself. It’s small but not flimsy and can fit anywhere in your kitchen, from the counter to the shelves. You can even get your whole family to learn how to make their own juices and encourage everyone to get more nutrients in their body easily through juicing. There is a slight price difference between the VSJ843RS and the VERT Slow Juicer VSJ843QS. Overall, if you’re looking for a juicer that’s great with all kinds of produce and don’t mind spending much for durability and efficiency, this one is a good pick. The low speed technology allows it to yield more juice than others, with dry pulp proving that you get the most out of your ingredients. It’s compact and easy to use and you wouldn’t have any trouble cleaning up as well. Another vertically designed masticating juicer that’s versatile and powerful is the Omega VRT350. It features the same patented auger for efficient squeezing and pressing of ingredients to yield more juice. It also employs a dual stage, low speed 80 RPM system. The heavy duty part comes from the strength of the strainer, which is more powerful than other Omega juicers. It has three settings which include a reverse option for when you need to remove something or unclog the juicer. You can pour water into the chute for easy clean-up when switching up your ingredients. It also has two large spouts that make it easy to serve drinks, as well as two containers for pulp ejection and fresh juice. For a small juicer, it’s very capable and flexible, and even addresses some simple needs that you didn’t know you wanted in a juicer. 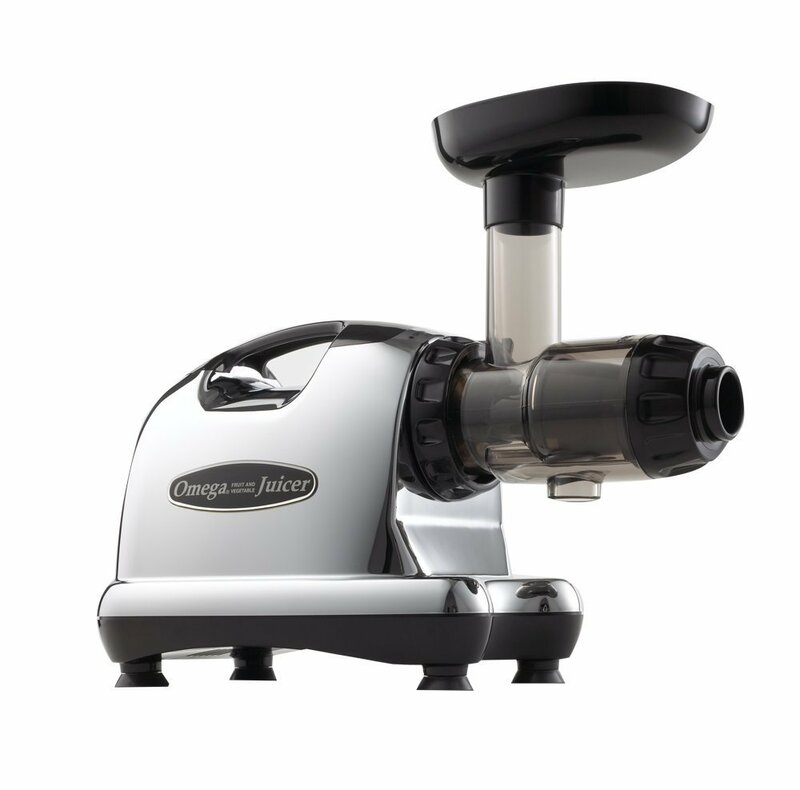 The Omega VRT350 is the most compact out of all five juicers in this list. It’s easy to assemble and even easier to stow away in the kitchen. It works great with all kinds of produce, be it leafy greens, fleshy fruit, root crops, or fine vegetables. Users even went as far as commending the VRT350 for producing the best tasting juice around in their Omega juicer reviews. Also, because of its vertical design, cutting up vegetables is no longer necessary – you can easily shoot the produce in there and it will do its job of juicing every last bit of it, leaving just the dry pulp behind. 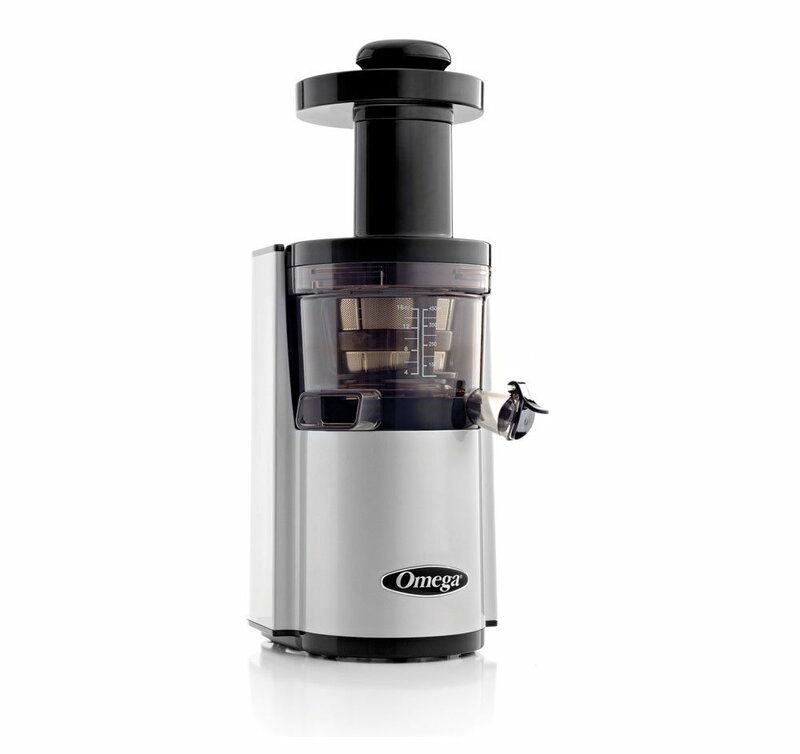 Like the VSJ843RS and the VERT Slow Juicer VSJ843QS, the Omega VRT350 also has an auto-cleaning feature that makes it more convenient than other juicers. It’s also cheaper than the VSJ843RS and the VERT Slow Juicer VSJ843QS, same as the NC800 and also around the same range as the J8006. If you are looking for a compact yet powerful juicer that works with anything and makes it easy for everyone to juice, the Omega VRT350 is a great pick. Omega Juicers has a wide range of products that can cater to all of your needs. Whether you want a versatile juicer that can produce baby food and nut milks or a compact and light juicer that works with all kinds of produce, you will find one that will suit your preferences among these five models. These products are all around a mid-range price point compared to other juicers, yet offer plenty of benefits that you wouldn’t be able to get with other brands because of their technology. 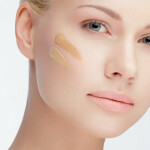 At first, it might be hard to determine which one among these five is the right fit for you. Just keep in mind what you’re going to use it for. Some of these models are more versatile than others, like the J8006 and the NC800. However, some are also for more specific uses, like the VERT Slow Juicer VSJ843QS. Either way, you’ll get what you pay for, and more importantly, you will be able to share important nutritional requirements with your family and loved ones. All of these models of Omega Juicers have stellar reviews on websites like Amazon, and with good reason. 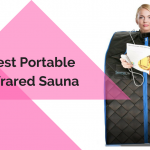 Whichever you decide to purchase will be a worthy investment because of its long warranty and durability – not to mention that all of them have a sleek design and sturdy built that you can’t go wrong with. These juicers are capable and more powerful than other brands in the market, given the dedication that the company has shown in perfecting its technology and systems. It’s up to you to nit-pick these models’ features and decide on what you should get. Any one of these products are worth your hard-earned money and will be sure to deliver fantastic juices that will give you the healthy dose of vitamins and minerals that you need.